As the year draws to a close, we have one more beta version for you. This one features the long-awaited GPU accelerated 3D Volume Rendering (for NVIDIA graphics cards). 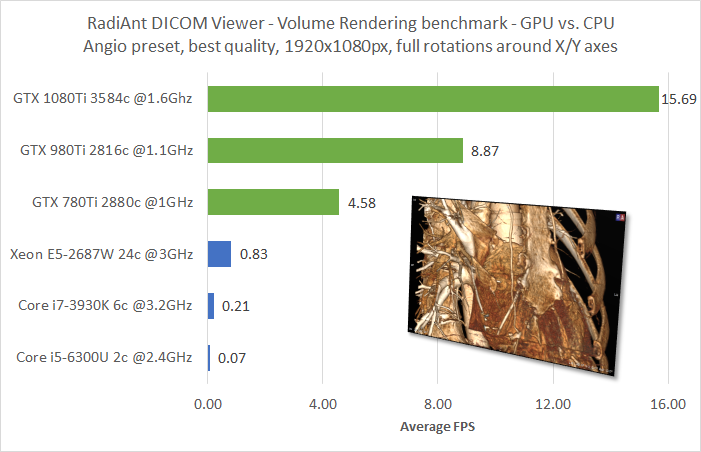 Check out how fluid the interactive VR can be - it is up to 100x faster than before (depending on your CPU/GPU configuration). Read more and download the new version here. We would also like to take this opportunity to wish you a Happy New Year! Our latest 4.2.1 release brings the C-GET protocol support to RadiAnt DICOM Viewer. This feature will be helpful for those who could not retrieve studies from PACS servers using the C-MOVE protocol for some reason (e.g., firewall, NAT). We have also added custom search presets to save your time while performing frequently used PACS searches. There are also a few minor improvements. The manual has also been updated to the latest version. We continue to improve the PACS client functionality with our next beta version (4.1.17). C-GET protocol was added to make possible downloading studies from PACS locations when for some reason incoming connections are blocked (firewall, NAT). Custom search presets can be added so that your favorite PACS searches are performed instantaneously. This beta version brings a few improvements to our viewer: quick text search within opened studies, custom search fields in PACS queries, support for radiant:// URL protocol and more. We are happy to announce that a new version of RadiAnt DICOM Viewer with the 3D MPR/MIP feature for visualizing volumes in oblique planes and thick slabs is now ready for download! Check this short video showing how the new 3D MPR feature can be used to visualize the aortic valve. It became possible only with our latest version that allows to reconstruct volumes in arbitrary planes. New languages: French (Philippe SCHÄCK), Dutch/Flemish (Patrick Cleys), Russian (Farabef - radiographia.ru). Updated: Italian (Sebastiano Amato). Thank you! Select and open specific DICOM files (Ctrl + O). Association with *.DCM files (double click DICOM file to open it in the viewer). Command-line arguments (-d and -f) support (radiantviewer.exe -d folder1 folder2 folder3 etc. and -f file1 file2 file3 etc.) to open specified files/folder after startup. Optional company logo/info image in license window (CD/DVD version). New page with options in the installer - association with *.dcm files, automatic updates, shortcuts. Binary files (exe, dll) are now digitally signed using Microsoft Authenticode certificate. Improved support for JPEG compressed DICOM files. Multilingual support (English, German, Italian and Polish languages included in setup). Slice location and thickness for CT and MR modalities. Ctrl + C copies displayed image to clipboard. Main window size and position is remembered and restored at startup. Improved compatibility with certain types of dicom files. Ellipse tool for mean value (density) and area measurement. Export DICOM images to JPEG and BMP files. The installer requests admin privileges (UAC prevented setup from writing to Program Files folder). In certain situations black stripe appeared at the bottom of the viewport. Corrected issues with image downsampling. New shortcuts: CTRL + DEL (deletes all measurements in current image) and CTRL + SHIFT + DEL (deletes all measurements in current series). Window preset name is displayed next to window level and length. Thumbnails and toolbar were not redrawn sometimes. Compatibility with older browsers (IE5.5, IE6.0, IE7.0) was enhanced. Refinements in image thumbnails (improved legibility in Windows XP). Cine button not working properly. We took some time to redesign RadiAnt DICOM Viewer homepage. Hopefully the new layout is easier to navigate and looks better than previous, temporary design. A simple manual was also added (currently it contains keyboard shortcuts list). After setting zoom to 100% significant performance decrease with large images was experienced.